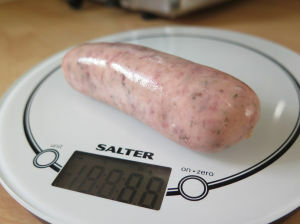 Jason Drage at the Churchgate Sausage Company does without doubt make some very good sausages and we don't know how we have missed these. 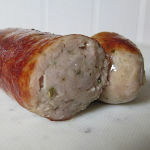 80% Essex pork shoulder, with sage and ground white pepper. Natural pork/hog skins. Rusk rather than breadcrumbs. 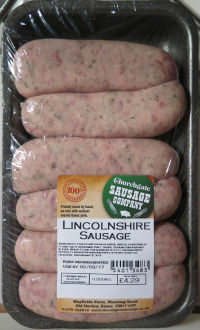 Now traditionally Lincolnshire sausages are made with coarse ground pork, quite a serious amount of sage and appear very green in colour, and yes OK there's been work by Lincolnshire Sausage Association to obtain a PGI European Protected Status on using the Lincolnshire name and recipe (yet to be established), but these sausages are after all Churchgate's own take on the "style" no doubt? Excellent looking in the raw. Cooked up they looked even better in the pan sizzling away. They kept their plumpness and we noticed very little shrinkage to be honest. The skins did appear quite fine in the raw but they held up OK being pan fried with no major splits or ruptures. On slicing the skins cut well without tearing and the succulence was immediately obvious from what appeared to be a smooth to medium texture. The taste was dominantly sage but you still get the pepper in there. The balance of seasoning was very good too as it happens. 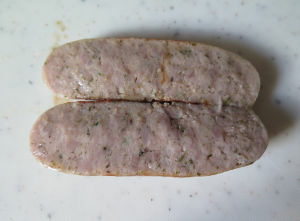 We've tried a few sausages recently and found them a tad too salty (for us, agreed) that has been reflected in our scores, but these Churchgate's we're pleased to say, are spot on. We liked these very much and will purchase again. Churchgate have a reputation for consistency of production too, so we'd be confident in recommending these LINCOLNSHIRES whenever you buy them! I kept a cooked one back to do the "eaten cold later" sample, but someone beat me to it. They said it was very good.